Personalised Wine - Unique Birthday Present Gift for any occasion. Select your occasion from the menu and Select the personalised label you require, fill in all the appropriate information and details and also make sure to upload your photo. You will then be sent back a proof image of your personalised wine birthday gift for you to confirm or suggest any changes. Within a couple of days you will receive your personalised wine gift and you'll be able to show it off and impress everyone at the party! Personalised wine gift makes the perfect gift for Weddings, Engagements, Anniversaries, Bon Voyage, Christmas, Valentines, Mothers Day, Fathers Day and many many more ideas. Know someone who is turning 18 and need to get them an awesome 18th birthday present they will never forget, we have the perfect 18th birthday present ideas for him and her. You can personalise our gifts with a photo and a unique message wishing him or her a happy 18th birthday. 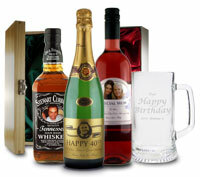 Choose from personalised wine, champagne, whiskey or other personalised 18th birthday gifts. Your 21st Birthday is a day you don't want to forget, it is a special occasion that signifies turning into an adult and an excuse to party. Make sure your son or friend remembers their 21st with a unique gift from yourself that they will treasure and remember for years to come. Personalised 21st Birthday Presents include personalised wine, vodka, champagne and whiseky among other. 30th birthday presents to get for men and females, women or even your sister. You can select from many 30th birthday presents including personalised 30th gifts such as personalised wine, personalised champagne and whiskey and even personalised gifts to go with this such as engraved glass gifts or hip flasks. Your gift will make an excellent keepsake for a 30th birthday party and everyone at the party will be impressed by the funny photo gift. 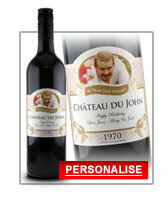 Upload an embarassing photo onto the label and add your message such as 'Happy 30th Birthday', '30 Year old Vintage' or 'Chateau du John'. We have now also doing personalised Jack Daniels Whiskey gifts, with mock spoof labels, which are very popular and a great gift to get someone if they are a big whiskey drinker or Jack Daniels fan. These gifts have been a big hit with our customers and to make a really good impression why not add a gift box. 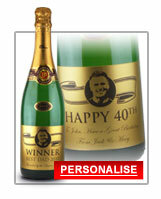 40th Birthday gifts includes personalised 40th birthday gifts for men husbands females and women. 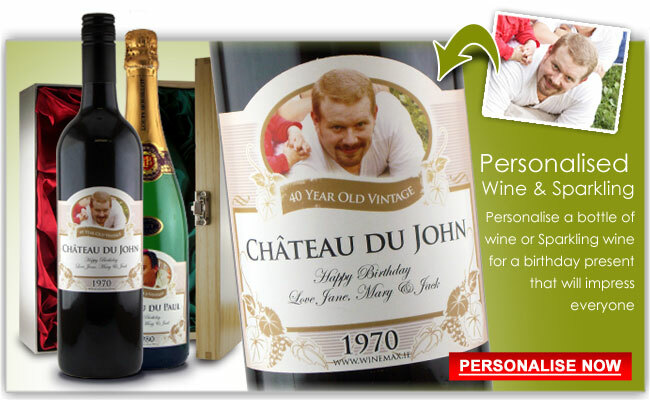 Personalised wine with photo on label and unique message to give as a unique idea at the 40th birthday party. 50th Birthday Gifts for men women dads and mums in Ireland. Personalised unique wine for 50th birthday gifts, also includes Whiskey Champagne and other personalised gifts for a unique 50th present. 60th presents mum dads or any men or women birthday. Send the 60th gift in Ireland and it can be delivered direct. Personalised gifts range including wine whiskey champagne. Unique and funny 60th gifts presents. Wedding presents as a gift you can give to the Bride and Groom to celebrate their special day. We also have Wedding gifts for the parents of the bride and groom or even gifts for the Best Man such as the personalised Jack Daniels. Give the wedding present to the couple with a photo of the couple together and a message printed on the bottle of wine or Champagne. We now have Wedding gift packs with a personalised bottle of quality sparkling wine and two personalised crystal champagne flutes, which can be engraved separately with the names of the couple. This gift also makes a great Engagement or Wedding Anniversary gift. As a Wedding gift you can also have personalised whiskey which you can put into a wooden gift box for a really special and unique wedding gift idea. It is hard to know what to get a couple as a gift who recently got engaged. 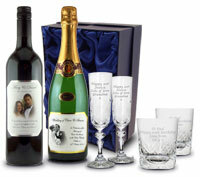 At Winemax a special Engagement gift includes quality personalised wine or personalised champagne style sparkling wine. 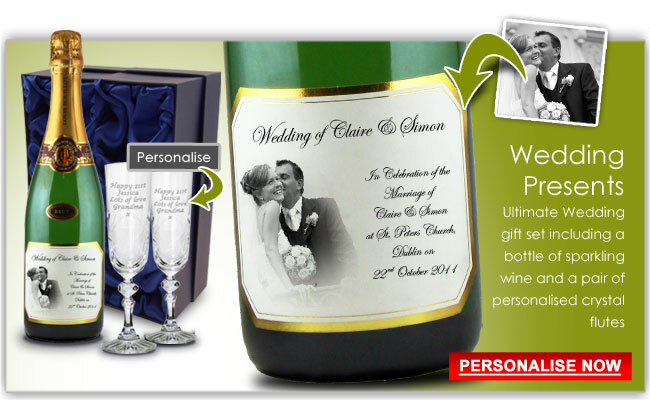 The label on the wine or champagne can be personalised with a photo and a message to the engagement couple. Adding a wooden gift box makes the engagement present a special keepsake. Valentines Present Boyfriend, Girlfriend, Husband, Wife or even Fiance. If him or her loves wine, then surprise them on romantic Valentines with bottle of wine gift in one of our gift boxes. Valentine gift to show your love. Fathers love whiskey & wine. Fathers Day gifts personalised Jack Daniels Whiskey or Vodka for Dad on Fathers Day. Funny fathers day gift with amusing photo and unique message. Perfect Fathers Day gift idea. Mothers love a bottle of personalised wine on Mothers Day. Rose wine gift with label of mother & daughter together. Deliver your mothers day gift throughout Ireland. Mothers Day gifts personalised gifts sets. Christmas is near & it is time to think about Christmas gifts for friends & family. Personalised wine gifts is perfect to give to people who you really love as an extra stocking filler, or give as a Christmas gift to people you are not sure what to get. The Christmas gifts can include a personalised bottle of Jack Daniels whiskey, vodka, Guinness and Baileys or our popular wine gifts and personalised champagne. Corporate gifts for clients & associates. Show your business partners some innovative thinking with a bottle of personalised corporate wine gifts. You can add your logo or business team photo to the bottle and thank your clients or important customers. Our corporate gifts can be cheap with good discount on bulk orders and are great to give as corporate Christmas gifts to clients associates and customers. Birthday presents and gifts for personalising. Choose your Occasion or event and then choose your label, upload your image and add your text to the text boxes to personalise the labels. You can personalise the birthday gift for 40th birthday or 50th birthday. 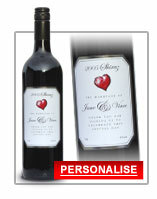 If you know the person loves wine, then they are sure to love a bottle of their own personalised wine. Our personalised products are excellent value for money and we consider ourselves the best value for money on personalised products in Ireland especially for funny 40th Birthday Gifts. The quality of the wine is superb as the wine we use is a popular commercial wine you will find in wine shops around Ireland. Our personalised wine and personalised champagne wine also comes with a free (organza) gift bag to add as an extra special touch to that Birthday Gift to your personalised wine, personalised whiskey, personalised champagne style sparkling wine and personalised vodka. Our personalised wine and personalised champagne service is considered one of the best in Ireland and have produced labels for numerous high-profile clients. Our service extends to businesses and individuals looking to give a bottle of personalised wine or personalised champagne as a gift or present especially for Birthday Gifts. 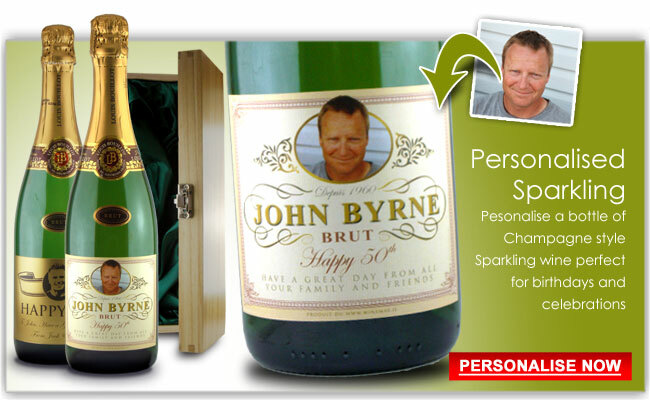 Or for businesses to give personalised wine or personalised champagne as a corporate gift or to their clients. Personalised wine makes the perfect Christmas gift, choose from our unique Christmas gift designs and personalise with your Christmas message. Personalised wedding wine gift is a unique wedding gift to get anyone getting married. Personalised wine can be personalised with a photo of the couple on their wedding day or the couple before they get married. Present the gift to the couple on their wedding day and it will be a unique personalised gift they will treasure for years. You can add your personalised message underneath the photo of the wedding couple wishing them a happy marriage. choose a wine for your gift or choose a sparkling wedding champagne gift for the special celebration. Personalised wedding wine is a unique and special product if your getting married in Ireland and looking for something different. Personalised wine makes a great unique engagement gift or wedding gift. Why not put an image of the bride and groom or a message to thank the guests for coming and sharing your special wedding day. Red and white personalised wine minis (187ml bottles of wine) make a great wedding favour for guests to take away and enjoy. They also look great on the table at your wedding. Or put a bottle of personalised red wine or white wine on the table or a bottle of personalised sparkling champagne style wine to make an extra special statement. View our pre-designed wine labels for ideas for personalised wedding wine. Personalised wine makes a perfect engagement or wedding gift to give to your friend, boyfriend, girlfriend, husband, wife, fiance, fiancee. A great champagne wedding wine label makes a fantastic unique elegant gift for the married couple. Personalised wine makes a great corporate gift for giving clients and customers. Personalised wine is unique and allows you to personalise with a message directly to your client, customer or associate. You can add your logo to advertise your business, add your slogan or add a picture of your new product. Your client, customer or associate will be impressed with the professionalism and uniqueness of the personalised wine and will help to improve the relationship between your businesses. Personalised wine makes a great Corporate Christmas gift, to give to clients, customers and associates this Christmas, this will help improve relations as the unique message will directly appeal to the recipient. The current economic climate means companies are having to be more and more unique and different in order to stand out, personalised wine and champagne will help add value and make your company stand out, attracting more business and customers. Take a look at our unique Christmas Corporate gift labels and personalise with your unique message directly targeted toward the wine drinker. Need a unique Christmas gift that will impress your friends and relatives. Winemax has a great selection of Christmas wine gifts you can personalise with your message and give as present for Christmas. We have unique gift ideas for personalising that you can give to friends and relatives as presents for Christmas that look really nice in a presentation box or the free organza bag. Personalised wine makes a great unique gift for boyfriend or unique gift for girlfriend at Christmas time. You can have personalised Christmas champagne with your own custom Christmas label. For a great Christmas gift idea pick a funny picture of your friend from Facebook and put into onto one of our labels. Send unique personalised gift to Ireland. 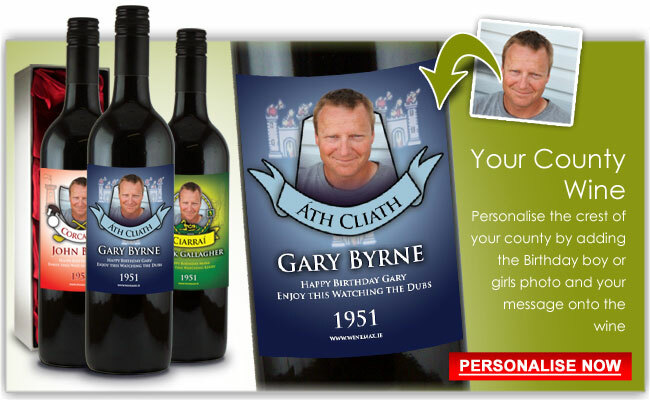 Put a picture of your family on a label to send to your relatives and friends in Ireland. With Winemax whether you are in Australia, America, Canada, UK or Europe you can send your personalised gift to your friends and family in Ireland. 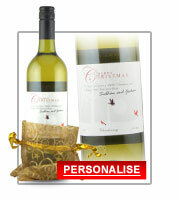 Personalised Christmas wine makes a great corporate gift to give to employees or associates. With Winemax you can choose a nice Christmas gift label and put the Christmas gift label on a nice bottle of whiskey, vodka, red white wine and champagne style sparkling wine. Don't forget Winemax.ie offers discount on case orders. Apart from personalised wines, personalised champagne style sparkling wine, personalised whiskey and personalised vodka, Winemax also specialises in quality wines from around the world. Winemax offers fantastic personalised wine and personalised champagne at great value for money. Along with our personalised wine and personalised champagne service we strive to offer great quality wine by the case, and hope to offer the Irish consumer great value and more variety in the near future. Recently we have started taking orders from international customers wishing to send a personalised bottle of wine to friends or relatives in Ireland. We have some fantastic wine, at great prices, cheap wines.